Guadalajara, Jalisco.- Carlos Roberto Mejía López made his last momentous trip in 2007, when he left Río Chiquito, Cortés, to head to the United States. On December 11, in the middle of the night, he embarked on another journey. But this time, ten years later, he knew his final destination; in the morning, he would arrive in Guadalajara to see his mother, Doris López. He would not longer have to ride a freight train, as he did at seventeen. Instead, he would climb onto a bus in Monterrey and cross 780 kilometers, to look into his mother’s eyes. He had left her behind in Honduras because he was tired of the misery that had enveloped their town. Nothing seemed to work for Carlos, who had been raised with five siblings. He preferred to join the wave of migrants who were leaving the region and heading orth. He managed to make it through Guatemala without trouble. When he reached Mexico, he hitched a ride on La Bestia, the train that used to be the most common form of travel for migrants in transit through Mexico. He started on the southern border, then passed through Veracruz, Puebla, the State of Mexico, Querétaro, San Luis Potosí and Nuevo León. In Monterrey, the train stopped for several days and instead of merely waiting for it to take him to the northern border, Carlos decided to find a temporary job. He called his mother from the city, which Mexicans have nicknamed the Sultan of the North, to let her know that she should not worry. They maintained contact for a few days until Carlos was robbed. Carlos was still a teenager, and the robbers not only stole his phone, but also any chance he had of communicating with his mother. From that day on, his family heard nothing from him. They had many questions. Did he cross into the United States? Did he end up living in Mexico? Has something happened to him? When Doris talks about Carlos’s history, she does so sparingly. She is a woman of few words, and the story unravels slowly. It is the first time that she has traveled with the Caravan of Central American Mothers and she’s been thinking about her elder son, as she’s done for years in Río Chiquito. 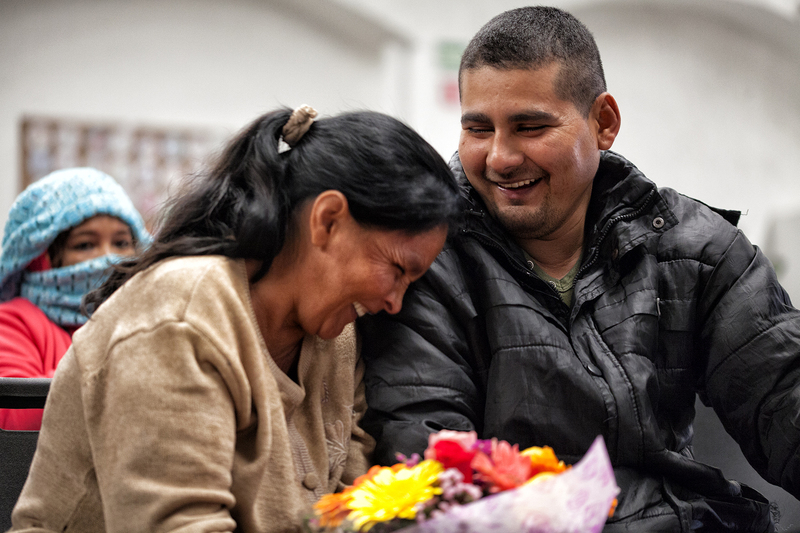 “When Ruben Figueroa” – a coordinator of the Mesoamerican Migrant Movement – “brought news that my son wanted to see me, I felt incredibly happy. I missed him, and all I wanted was to hug him,” said López, who is now 47. Since it was a special day, she dressed in her favorite flower-print dress. The anxiety of ten years without her son were about to end. The sad days in Cortés would be gone, and her tears in the shelter FM4 would be happy ones. She would see her beloved son, then hear his new accent. The ten years that Carlos have passed in the municipality of Garcia, in the northern part of the metropolitan area of Monterrey, have changed him. Not a hint of Central American intonation remains. At ten in the morning, Carlos, who is now 27, arrived at the shelter along with Rubén Figueroa. In the minutes before they entered, he mentioned that he works in construction, has four kids, and does not think of leaving the northern part of Mexico. But as he approached the center of the room, Carlos looked at all the mothers who form part of the caravan, and then spotted his own. He started to walk faster, and before reaching the plastic chair in which Doris was seated, he bent over in tears. The ten years and 2,300 kilometers were reduced to a loving hug, perhaps the most fervent one either of them has ever given. The third grand trip of Carlos Roberto Mejía commended in the afternoon of December 11. He returned to Monterrey, but with one significant difference: his mother, Doris, accompanied him the entire way there.